Heck, what does it take to lead today? The timeless core aspects of leadership, such as setting direction, engaging employees, and holding them accountable while influencing others remain. More and more, however, one of the vital leadership capabilities that must be honed now and tomorrow is managing cross-cultural and global teams. That’s why Cultural intelligence must be on your agenda. When you’re running a meeting with people from different cultures, how do you brainstorm ideas, make decisions, and address conflict in a way that’s comfortable for everyone? When you are managing performance with a diverse talent pool with various age groups, education levels, and multiple cultures, how do you manage your biases and the different needs of the workforce? How do you differentiate performance while providing equality of opportunity? 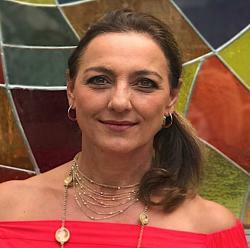 Research has highlighted specific dimensions on which national cultures vary, like Erin Meyer’s Culture Map and Hofstede’s 6 National Culture Dimensions. Delving a little into cultural differences, we learn that how people approach the world is very varied. For example, there are people who avoid conflict and others who seek it out. All offer valid reasons why conflict is or is not good thing. Some cultures embrace individualism, take care of themselves first, while others prefer to look after their relatives or close circle of friends with unquestioning loyalty. In some societies people have different views on the value of being tough versus tender. Some focus first on achievement, heroism, assertiveness, and material rewards. Others favor cooperation, modesty, caring for the weak, and quality of life. What do these and other difference mean for leadership? Organizational Intimacy. Having full understanding of the organization’s strategically aligned goals, behaviors, and core values with a view into future organizational and societal needs. Self-Intimacy. Being fully aware of one’s self with an in-depth self-knowledge. Being comfortable with self-disclosure and excellent at self-regulation. Social Intimacy. Having a deep awareness of others and being savvy about the complex causes of human behavior. Moving toward trust, so that the other person in a relationship feels safe and comfortable enough to share. Influential Intimacy. Using all three deep familiarities to facilitate the growth of everyone involved as human beings, a team, and an organization. This is leadership being adaptable to the digital revolution, adaptable to different perspectives, ideas, and people, adaptable to the way you have always done things. What can your leaders do to prepare for great leadership in the future? Do at least one thing, today. In my practice I come across many leaders who hold onto their way of management too dearly. Some even beat their chests with pride and say, “That’s just the way I am,” and “It’s just what I believe.” I believe in authentic leadership — being myself. I say we also need to become better versions of ourselves. We all have a responsibility to unlearn some behaviors, update other behaviors, and adapt yet another set of behaviors. With intimate self-awareness we must question what emotions, thoughts, behaviors, and communications no longer serve us in this changing world. We are all responsible to become more inclusive to different perspectives and cultural nuances. Everyone can do something to practice some self-management strategies such as adapting our behaviors, exercising more self-reflection, promoting greater self-awareness, and taking a more objective perspective to people, ideas, customers, differences, and emerging markets. 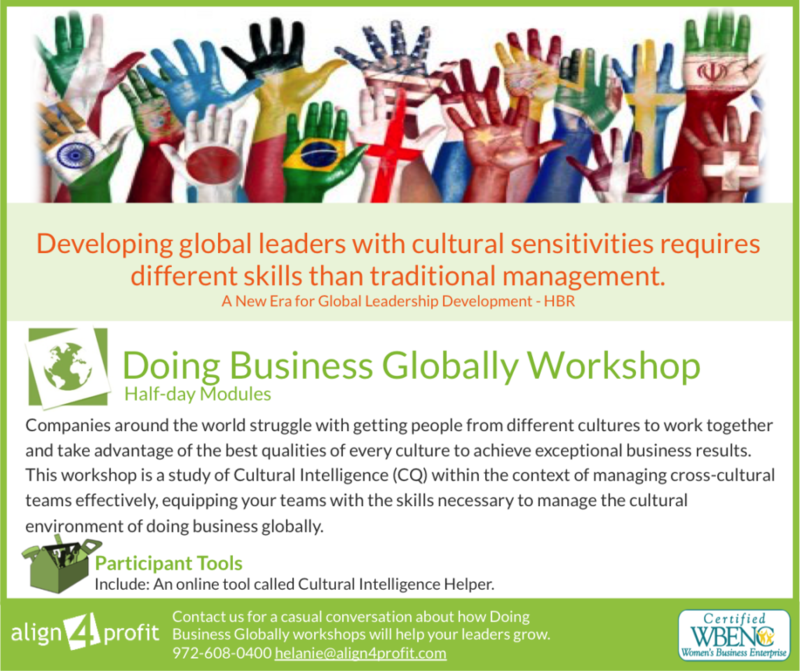 Equip your managers and teams with the skills necessary to manage the cultural environment with our Doing Business Globally Workshop. Participants gain access to our commitment process to follow through on embracing a select view of the 13 diversity behaviors and get life-long access to our online tool called the Cultural Intelligence Helper. A tool to help you find your way around the world without tripping on your good intentions. Let’s talk about how we can customize our training to support your exact needs and specific cultural environment. Let’s get intimate and give you the training you want in the way you want it!